You've probably heard that legally required disclosure countless times when you call your bank, utility company, or other service providers. Chances are, you rarely put much thought into it. However, when your business is starting to research solutions to record business phone calls, you can't just zone out and press 0 to speak to an operator. Many companies are surprised to learn that the right approach to consent can vary from state-to-state and that failure to follow the laws can result in steep civil penalties. Call recording software can provide immense business value for companies of all sizes as a tool for training, customer service, and performance. Before you can unlock the benefits of call recording, it's important to understand the right way to record telephone conversations legally and ethically. If your business is considering call recording, there are several considerations to keep in mind. Your organization will need to select the right approach to technology for your requirements and fully understand the legal requirements for ethically capturing business conversations. Increasingly, organizations are opting for cloud-based call recording software as an alternative to premises-based call recording systems. Cloud-based call recording is a software-as-a-service (SaaS) option offered by Unified Communications as a Service (UCaaS) and hosted voice services vendors. This approach offers transparent pricing, compatibility with existing software, easy management, and simple solutions for data storage and backup. In contrast, premises-based solutions mean your company is responsible for data storage and security, as well as responsible for the upfront costs of acquiring software and servers. The U.S. government has specific laws in place for recording phone calls. Your business must fully comply with these federal and local laws, which vary significantly between states. These laws dictate how companies must approach topics of knowledge and consent before capturing recorded calls, computer usage, email exchanges, or wireless communications. Finally, it’s important to note that businesses who deal with national security issues, such as government contractors, are subject to a different set of laws about call recording. If your company works with government agencies around sensitive security topics, a qualified legal expert can provide specific guidance on your requirements. Financial, medical and education organizations need to make sure they're up to speed about relevant laws, too. What are the Benefits and Drawbacks of Recording Business Phone Calls? Many businesses think call recording is mostly used as a tool for training and performance management in large call centers. Contact centers are among the most common use cases for recording business phone calls, but they’re not the only use case. Organizations of all sizes and in all industries can benefit from call recording as a tool for marketing, sales, and customer service. With the advent of Unified Cloud Communications tools, it’s easier than ever to integrate many call recording programs with your marketing automation platform (MAP) or customer relationship management (CRM) software for a comprehensive record of client communications. As technology for recording calls has improved, and the costs of data storage have decreased, recording telephone conversations is a viable and useful option for more companies than ever. While recording calls can offer unique and significant benefits to your business, it also has some potential drawbacks which organizations should consider. Are Knowledge and Consent Required? Your businesses' legal requirements for ethically recording calls depend on state law. While twelve U.S. states have laws for call recording which require all parties on the call to give consent, including during business conference call situations with multiple participants, the majority have adopted less strict requirements. In most U.S. states, the consent and knowledge of one party on the telephone conversation is required. In some states, your business can rely on "implied consent," which means that if a person continues to participate in a conversation after being informed the call is being recorded, they have implied consent. This definition isn't absolute and can vary between states. Failure to follow and understand your requirements can result in costly fines, civil penalties, and loss of customer trust. Twelve states prohibit the recording of calls without the knowledge and consent of all parties on the telephone conversation. The majority of states in the U.S. prohibit the recording of a telephone call without the full knowledge of one party on the call. The laws in one-party states are patterned after the federal wiretapping law. In these states, one party may record a conversation without the knowledge or consent of the other party if the other party is also in a one-party state. If your business operates in a one-party state, it doesn't mean you're off the hook for getting consent to record calls. There's a great deal of legal liability when it comes to recording business phone calls. If your business is going to record someone, you need to follow all the state laws which impact every party on the phone call. What if your business in Virginia, a one-party state, calls a client in Maryland where all-party consent is required? In this common situation, you are responsible for following the laws of both states, including obtaining all-party consent. The mobile phone owner may have moved to a different state. It could be a business VoIP number for a remote worker in a two-party state. The individual may be out-of-state for business travel or in-transit across state lines. Making any assumptions about consent laws based on an area code is risky business which could lead to being liable for wiretapping or invasion of privacy. To mitigate your company's risk, consultation with legal counsel is the best path to understand the specifics of civil liability laws. Obtaining consent to record phone conversations is likely the best way to protect your company from the complexities of the legal climate. What are the Requirements on Backups? Before cloud technology, businesses who relied on call recording had to use an in-house tool to archive and store audio files. Historically, the most cost-effective approach was the use of backup tapes, which are physically stored on site. While premises-based storage with SAN drives or tapes is a relatively simple technology, there are definite risks to this approach. Physical tapes can easily be lost, misplaced, or destroyed during a natural disaster or break-in. When businesses needed to access archived calls, locating and restoring backups was time-consuming. Using the cloud as a tool for business call recording backups is a more cost-effective option for many organizations. Not only does cloud storage scale cost-effectively, but the distributed cloud computing model also protects your business from data loss in case of natural disaster or theft. Finally, depending on your business and industry, cloud backups may even protect your organization from compliance risks. If your business is subject to specific regulatory requirements, you may be required to follow specific laws which dictate the security requirements for storing call data and how long it needs to be retained. If your business operates in a highly regulated industry, fast-track providers who can demonstrate compliance with applicable regulations. Encrypting audio call files can protect your business from information security risks. While some industries may be required to encrypt data-in-transit and at-rest, the majority of companies can benefit from this type of protection. Ideally, all call recordings should be encrypted before they are transferred to the cloud and protected with encrypted access keys to limit availability unless you are actively trying to restore an audio file. Cloud-based solutions for call backup generally provide an organization advantage over premises-based tape recordings. Preview potential call recording platforms to ensure call metadata is stored with audio files to simplify file access when needed. To save costs on cloud solutions by bundling services, ask if call recording is offered by providers known for their great VoIP service and support. Many companies can benefit significantly from business call recording. Capturing call audio can help your organization achieve goals of better customer service and stronger employee training. Securely retaining audio files could even protect your organization from legal or compliance-related risks. Before you adopt a call recording solution, it’s important to understand the legal requirements for ethical recording and how these laws vary between states. In virtually all cases, your legal counsel may advise you that full knowledge and consent is the best way to protect your business from risks. With legally compliant software and secure cloud backups, unlocking the rewards of telephone conversation recording can be relatively simple. 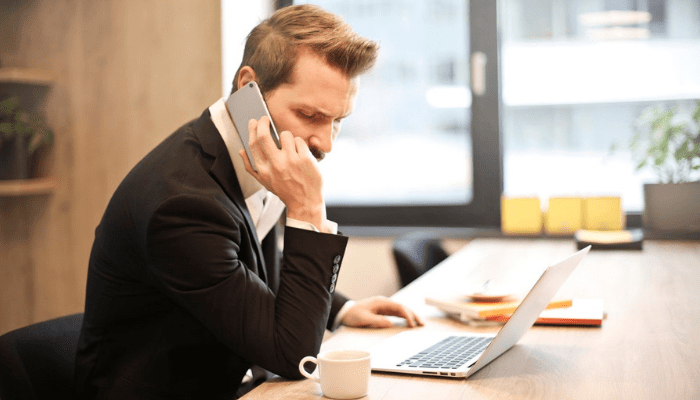 Before you buy cloud communications solutions for business phone service, there are a few questions you should ask providers to ensure you're getting the best value possible. To understand the questions you must ask before picking a provider, download the free eBook: 10 Questions to Ask Before Buying Phone Service for Your Business.